Chants is my 8 yr. old white boxer, aka: Buddah, Da-boo, Chizzy, Monkey, My Baby Boy. His right hind leg is healing. He already had 3 knee surgeries (2 ACL repairs, 1 torn meniscus) when he was 3 & 4 years old, happend from running like a maniac, off leash in Central Park. Now the surgeons are prescribing a 4th and I am opting not. His legs are full of arthritis. For the last 9 days Chants did PT. 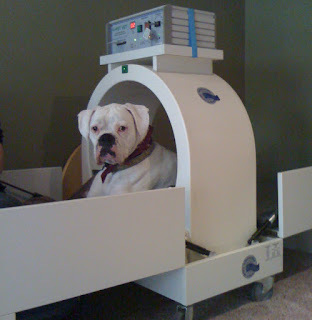 He had Pulse Signal Therapy, Cold Laser, massage and stretching. He continues to recieve Reiki, Acupuncture, Chiropractic, herbs, strengthening exercises, and a whole lotta LOVE from his momma! Chantsy is definitly on the mend as he even got to the beach for sunset tonight - first time in a long time. Please send Chants some of your light so we can continue to avoid surgery.